You know I tend towards the dramatic with my pronouncements about Tottenham, but I don�t think I�m going over the top by describing April 2018 as one of the most vital months in the history of the club. 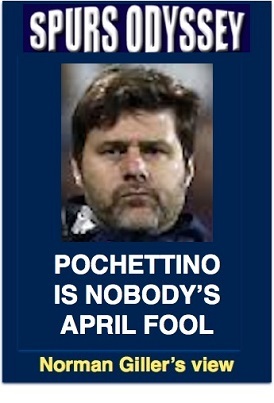 During a month when hope springs eternal, Pochettino�s Spurs can prove they have arrived as a serious long-term challenger for the major prizes, and I am confident Mauricio will not be left looking an April fool. They can clinch a top four position in the Premier League and the prize of Champions League football again next season. Plus, Spurs can book � at long last � a place in the FA Cup final after falling at the semi-final hurdle in the last seven attempts. The last victory was in 1991 and THAT Gazza free-kick against the other North London club. Gooners' goalkeeper David Seaman still does not know that the ball flew past him! That�s enough pain and punishment, thank you very much. Victory over Manchester United from the away dressing-room at Wembley on April 21 is vital for Tottenham�s prestige and self-belief. I feel sorry for the Spurs fans who are having to pay through the nose for the privilege of watching the semi-final, and only a win over moaning Mourinho and his United team will compensate them for the exorbitant prices. Sunday April 1 (ko 4pm): Chelsea away, which has continually proved a Bridge too far for Tottenham in recent seasons. It was Saturday February 10 1990 when Spurs last won at Chelsea. That was the day Nelson Mandela was released from prison. Yes, it was that long ago. For the record, David Howells and Gary Lineker were the scorers in a 2-1 victory. Saturday April 7 (ko 3pm): Stoke City away. Paul Lambert is the new manager at the Potteries club and determined to steer them away from the relegation zone. Saturday April 21 (ko 5.15pm): Manchester United in the FA Cup semi-final, with Spurs in the �away� Wembley dressing-room. Oh to be in England now that April�s there � Happy Easter! 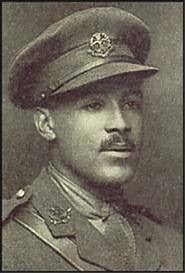 Yesterday marked the centenary of the death on the battlefields of France of Walter Tull, former Spurs footballer who was the grandson of a slave who had the distinction of being the first black officer in the British Army. Born in Folkestone in 1888, he was the son of a Barbadian who had arrived in Britain in 1876 who then married a Kent girl. Walter�s mother and father had both died soon after his seventh birthday, and Tull was brought up along with his brother in a Methodist-run orphanage in Bethnal Green. He was spotted by a Tottenham scout playing amateur football for Clapton (not to be confused with the professional club Clapton Orient), and in 1908 he signed for Spurs. Tull was the first black footballer of the 20th Century to play in the League, following in the 19th Century pioneering footsteps of black footballers Andrew Watson and Arthur Wharton. A quick and powerful inside-forward or wing-half, Tull spent two seasons with Tottenham during which he was involved in an unpleasant and unsettling racial incident while playing at Bristol City when he was abused by City fans, who according to one report used �language lower than Billingsgate�. It led to a loss of confidence, and in 1910 Tull was sold to Northampton, where he played 110 games. He was good enough to attract the interest of Rangers, a move that appealed to him because his brother, Edward, was working in Glasgow as a qualified dentist. Just as a deal was being discussed, war was declared. Tull enlisted with the 1st Football Battalion of the Middlesex Regiment, and was quickly promoted to sergeant. Tull served on the Somme until being invalided back to England in December 1916 suffering from trench fever. On his recovery, he was sent to officer�s training school at Gailes in Scotland and received his commission in May 1917. This was an astonishing achievement at a time when the British Manual of Military Law specifically excluded �Negroes from exercising actual command� as officers. It was Tull�s superiors who recommended him for officer training, a remarkable testimony to his charisma and leadership qualities. Lieutenant Tull was sent to the Italian front, and was mentioned in dispatches for his �gallantry and coolness� following the Battle of Piave. The war was into its last months when he was transferred to France, where a push was on to break through the German Western Front defence. On March 25, 1918, Tull was ordered to make an attack on a heavily fortified German trench at Favreuil. Soon after entering No Man�s Land and leading from the front, Tull was hit by a German bullet and fell mortally wounded. His men risked their own lives against heavy machine gun fire in a bid to retrieve his body. It was an indication of how highly he was thought of by those to whom he had to give orders. Tull was 29. It was 1999 before Tull, a hero on the pitch and in the trenches, got long overdue recognition with the opening of a Walter Tull Memorial Garden next to Northampton Town�s Sixfields Community Stadium. I am grateful to David Welch, a Spurs disciple since the 1950s, for reminding me of the anniversary date of our hero�s passing. Emeritus Professor of Modern History and Director of the Centre for the Study of Propaganda & War at the University of Kent, Professor Welch wrote: �To mark the centenary of the death of Walter Tull and the campaign that Michael Morpurgo and others (including myself) launched in 2012 to award him his Military Cross posthumously (now taken up by David Lammy and other Parliamentarians), I was wondering whether there is not a case for a statue or at least a commissioned bust of Walter in the new Tottenham stadium? There are plans for a Spurs museum at the new ground, and this would be a fitting place for our heroes like Walter Tull, founder member Bobby Buckle and master manager Bill Nicholson to have permanent memorials. It is important that Spurs remember our heroes from the past while cheering on the idols of the present. WEEK 32 of the Spurs Odyssey Quiz League 2017-18. The rules are simple: I ask one Tottenham-related question for which a right answer earns you two points, and then a related teaser that can bring you an extra point. Who managed the last Tottenham team to win against Chelsea at Stamford Bridge, and with which club did he win his two England caps as a player? Please email your answers by Friday�s midnight deadline to: soql32@normangillerbooks.com. Question 31 was: Who won five of his 61 international caps while with Tottenham and reached a fifth FA Cup final in 1987? With which club did he start his League career in 1966? Virtually everybody came up with the right answer: Ray Clemence, who started his great career with his local club Scunthorpe before joining Liverpool. I wonder how many more caps he would have won but for the presence of the mighty Peter Shilton? England were spoiled for choice in those days of goalkeeping masters. First name drawn from the correct answers: Gus Armstrong, a Spurs supporter for more than 40 years who was born in Enfield and now lives Down Under in Australia, where there is a huge Tottenham following. I will send Gus a screen version of my Spurs �67 book (I have now sold all copies, and the book raised �4,000 for the Tottenham Tribute Trust to help our old heroes Thank you all those Spurs Odyssey followers who gave their support).